Richard Pennycook is putting his money where his mouth is as he tries to build a business fit for the future. £750,000 is a lot of money to a lot of people. But for Co-op boss Richard Pennycook it represents a massive 40% cut in his basic level of pay compared to the £1.25m he got last year. The corner shops-to-insurance mutual is undergoing a big turnaround after the dramatic collapse of its banking arm back in 2013 and Pennycook is clearly keen to show that his own remuneration is not exempt from the penitence the business has to pay. And it’s not like that cut in his basic will be recovered through a hike in his bonus or benefits – his long and short term incentives are being cut too. ‘As a consequence, Richard’s total remuneration will fall to a level well below the median for organisations of the scale and complexity of the Co-op,’ the company said in a statement. It’s a great piece of PR for the business, especially when combined with an 8.5% pay rise for 40,000 of its shop workers. 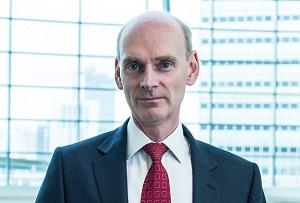 ‘The move by Richard to reduce his pay shows the Co-op difference in action, as we champion a better way to do business for our members and their communities,’ said its chairman Allan Leighton, who donates his own six-figure salary to the Co-operative Foundation. The Co-op still has a lot of bouncing back to do. Though it’s jettisoned its bank and most of the bad memories of the shock drug scandal that claimed the career of its former chairman, the ‘Crystal Methodist’ Paul Flowers, it’s still very much in the ‘rebuild’ stage of Pennycook’s ‘rescue, rebuild, renewal’ plan. It’s still in the black, according to its latest annual results published today, but profits dropped 81% hit to £23m as it splashed the cash on new shops and funeral homes and fought to keep up in the price war that has engulfed the grocery market. Its flagship food shops have held up well as consumers have switched from big weekly shops at out-of-town to supermarkets to more regular trips to convenience stores. Like-for-like sales there were up 1.6%. Its legal services division returned to profit last year, insurance held steady and sales in its funeralcare business were up almost 9.9% to £399m after an unexpected spike in deaths last year. Having rescued the co-op from governance scandal and financial peril, Pennycook’s job now is to make sure Britain’s biggest mutual is fit for the future. He may have ruled out a move into online grocery sales but hiring a chief digital office last year was one step in the right direction. And slashing his own salary shows he’s in tune with the public mood on executive pay – even if a £750,000 payout is still beyond the wildest dreams of most.